Towards the end of the mango season and in the rains we in Goa make a delicious mango jam, every season. The names of this golden yellow jam made from mango pulp are many like Mangad/Manggad, Ambya cho Saat/ halwo. The best part is no preservatives or thickeners are used. Varieties of mangoes that are native to Goa are many. These are a few that I know of Mankurad the mango by which the Goans swear by, Malgesh, Bishop, Afons, Mangilal, Mussarat, Xavier. Of these Mussarat is mostly used in the preparation of jams, sweet pickles and processed products. We have a small mango tree that bears Alfonso mangoes. This year we had a lot of mangoes next year the tree will rest. This is a natural cycle, however, a lot of people are now injecting their trees and getting the fruits every year. I do not agree with this everything has a cycle and it’s better not to interfere with nature. Anyway, like I was saying we had a small crop of about 300 or 400 mangoes. With hubby not in town I was unable to handle the crop. Now the mangoes are all over I miss the every morning ritual where I went down to get the fallen mangoes. Many a times they were split or the citizens of the tree had got to them first. I believe they were the sweetest mangoes. After distributing to friends I still had a lot many left and with only me eating them I made Mango Jam with these mangoes. The other mango recipe I have tried in the past arePeach and Mango Salsa, Ambe che Sasav/ Mango Sasav ~A traditional Goan Dish, Mango Recipes we Love. The preserves I have made from mangoes are Gor Keri a Raw/Green Mango Pickle, Keri Ki Launjee/ A Raw Mango Preserve, Mango Murabba /Amba cha Murabba/Green Mango Preserve. Jams from fruits are Red Chilli Jam, Grape Jam|Black Grapes Jam| Grape Jelly, Strawberry Jam. To understand Jam making check this out. This Goan Mango Jam needs only two ingredients mango pulp and sugar and my jam is made from organic mangoes. The only fertilizers we have used are the leaves that fall of the tree. Making this Mangad is simple but time consuming as you use low flame. Serve this this ammya cho halwo with Chapatti, or as a sandwich. But take care to preserve it in the fridge and use a clean dry spoon to serve it. Transfer the pulp of the mangoes in a thick bottomed pan. Transfer to a steel container or a glass container. Keep the glass container on a wooden board till it cools fully. 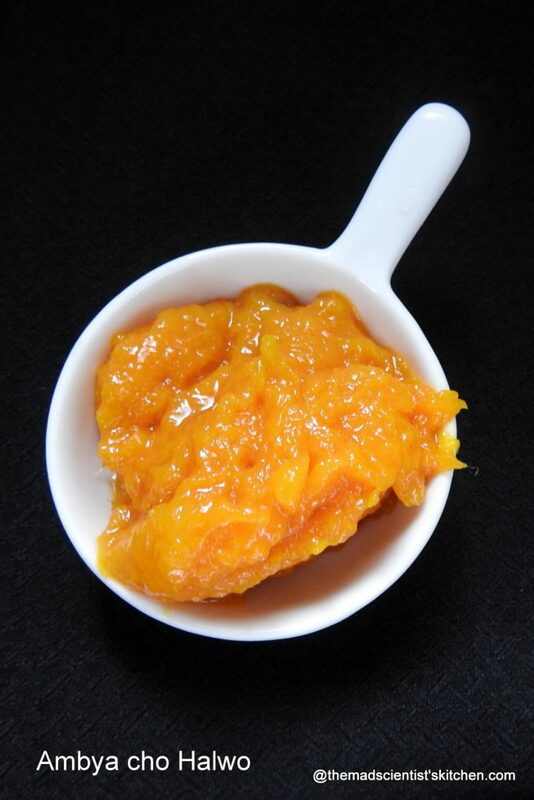 yum yum…mango jam looks great..wonderful recipe.. Welcome back dear 🙂 The jam came out perfect, love homemade preserves! 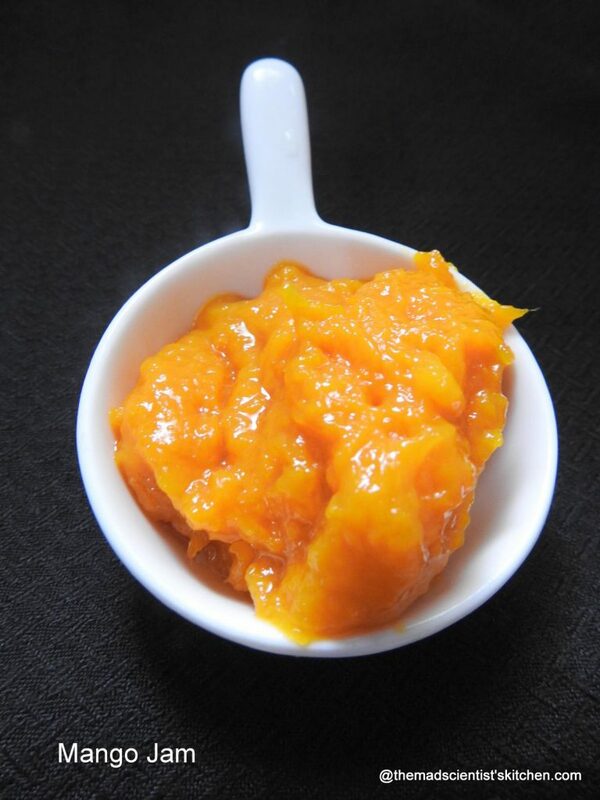 Yum ….home made mango jam sounds so great ..
A simple and easy jam and delicious looking. Having your mango tree and that too Alphanzo variety is a total treat . A jam with these must be simply wow ! Lovely color and looks yum. I can have this anytime. But jams are not so popular at home. Omg, this jam is a real torture, wish you pack me some. what a gorgeous vibrant color! Awwww who would say no to this mango jam. Love the fact that it doesn’t have any preservatives. Very nice. That is a nice way to use those ripe mangoes. I would love to eat the jam with a whole wheat toast.